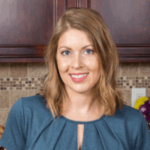 Published: Dec 17, 2014 · Modified: Jan 17, 2019 · By Jen Sobjack · This post may contain affiliate links. Isn’t this cake stunning? It screams holiday just like my yule log cake and peppermint meringue cookies! 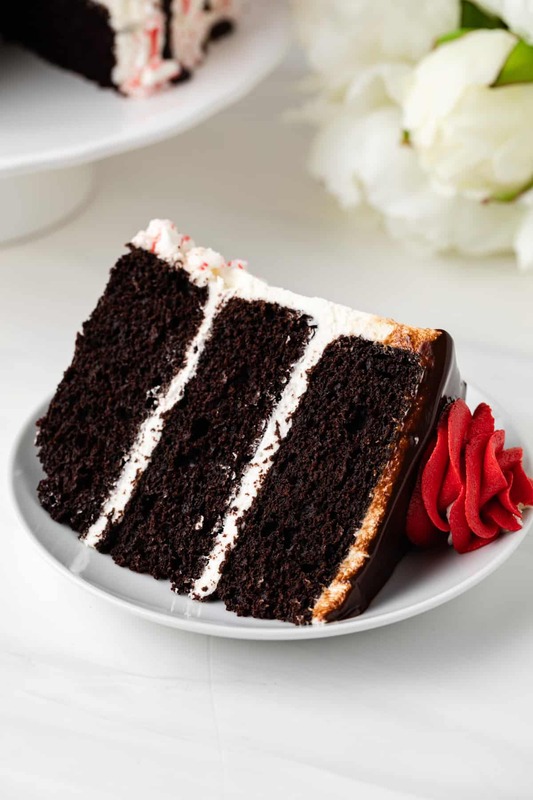 There’s a triple layer of fudgy chocolate cake with peppermint buttercream frosting sandwiched between each layer. 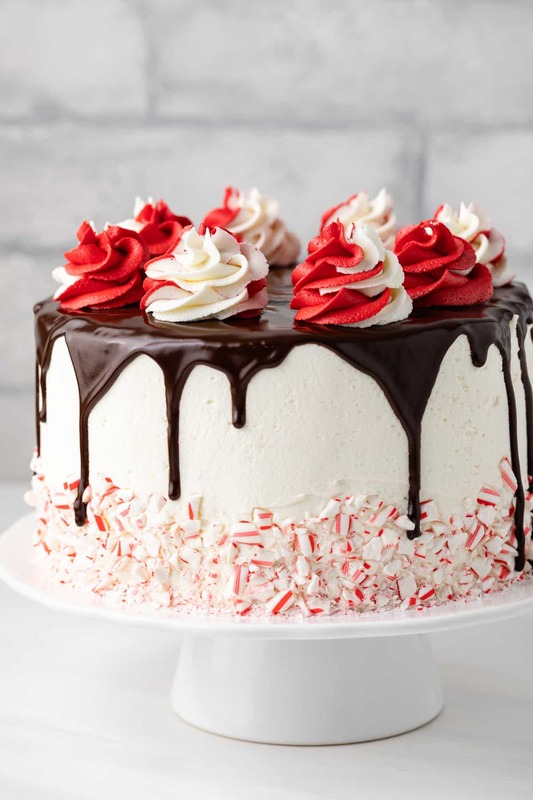 The cake is coated in a thin layer peppermint frosting as well and decorated with crushed candy cane all around the sides. A decadent chocolate ganache is layered over the top of the cake and allowed to drip halfway down the sides. I just love the look of drip cakes. My chocolate coconut cake is another one of my favorites. For a finishing touch, red and white swirled peppermint frosting is piped on top of the cake. This really adds to the festive holiday feel, making the cake perfect for a Christmas party. This cake is extra rich, fudgy, and decadent. To achieve this I used dark cocoa powder along with melted unsweetened baking chocolate. There’s also a hint of coffee mixed in to heighten the chocolate flavor. I find that adding both cocoa powder and baking chocolate fills the cake with intense chocolate flavor and yields a rich, almost brownie-like, texture. Be sure to use quality chocolate also, as this will greatly impact the flavor of the cake. Ghirardelli is one of the brands of chocolate I use most and chose to use it for today’s peppermint fudge cake. For more fun cake recipes, try this Chocolate Pistachio Cake, this Eggnog Cake, and this Pineapple Carrot Cake. Heat the oven to 350°F. Spray 3 8-inch round pans with nonstick spray. Line the bottoms with parchment paper cut into a circle to fit the pan. Spray the parchment paper with nonstick spray and dust the pan lightly with cocoa powder. Tap out any excess and set aside. In a medium bowl, combine the flour, cocoa powder, baking soda, baking powder, and salt. Stir with a whisk and set aside. Add the chocolate to a small heatproof bowl and set it over a pot of barely simmering water. Stir continuously until melted and smooth. Remove from heat. Set aside to cool. Using a stand mixer fitted with a paddle attachment or a handheld electric mixer beat the butter and sugar together on medium-low speed until light and fluffy. Beat in the eggs, one at a time, mixing well after each addition. Scrape down the sides of the bowl as needed. Beat in the vanilla. Add the melted chocolate and mix until well incorporated. With the mixer set to low speed. gradually add half the flour mixture, followed by the buttermilk and coffee, and then the remaining flour mixture. Beat just until combined. The batter will be thick. Divide the batter evenly between the 3 prepared pans. Use an offset spatula to spread the batter all the way to the edges of the pan and smooth out the surface. Bake for 30 to 40 minutes, or until a toothpick inserted into the center comes out with only a few dry crumbs. Cool the cake in the pans for 10 minutes, then invert the cakes onto a wire rack to cool completely. Peel the parchment paper off the bottoms before filling. Combine the butter and peppermint extract in a large mixing bowl. Using a handheld mixer or stand mixer fitted with the whisk attachment, beat until combined and creamy. Gradually beat in the confectioners' sugar, one cup at a time, until the frosting becomes thick and fluffy, about 5 minutes. You may need more or less confectioners' sugar depending on how soft the butter is. Reserve 1 cup of frosting in a separate bowl and set aside for later. Place one cake layer onto a serving platter. Add a generous amount of frosting and spread it to the edge with a spatula. Repeat with a second cake layer, topping it with a generous amount of frosting. Add the third cake layer and cover the top and sides of cake with frosting. Press crushed candy canes into the sides of the cake near the bottom and coming up less than halfway. Set the cake in the freezer for 10 minutes. Place the chocolate, butter, and corn syrup in a medium heatproof bowl set over a pot of barely simmering water. Stir until melted and smooth. Remove from heat and let cool for 5 minutes. Spoon 1/4 cup of the chocolate glaze over the top of the cake. Drizzle the remaining glaze along the edge of the cake all the way around, allowing it to drip down the sides. Set the cake back into the freezer for 10 minutes. Divide the remaining frosting in half and color one half with red food coloring. Transfer each frosting to its own piping bag. Insert a star piping tip into a larger piping bag. Cut the ends off each piping bag holding the frosting and insert them side by side in the large bag containing the tip. Pipe swirls on top of the cake. Keep the cake refrigerated and remove 30 minutes prior to serving. Wrap baked and cooled cake layers tightly in plastic wrap and store them in the refrigerator. The frosting can be prepared, covered, and refrigerated overnight. Assemble and frost the cake within 2 days. Because of the texture of this cake, cold cake layers are easiest to work with. Once the layers have cooled, wrap them tightly in a few layers of plastic wrap and pop them into the freezer for a few hours or up to 2 days. When you are ready to assemble the cake, set the wrapped layers on the countertop for 30 minutes to thaw slightly. Continue with frosting and layering the cake. OMG this cake was awesome! I wanted a new Christmas dessert and came across this one on Pinterest. I sorta screwed up the batter and added too much cocoa and the cake still turned out great. I also did a basic ganache recipie I already had that was just a simple equal parts cream and semi-sweet chocolate. This was probably the best chocolate cake I’ve ever had. Such a beautiful Christmas dessert. Thanks Jen, this will definitely be a family staple! Hi Erika! Thanks for sharing your feedback. I’m thrilled you enjoyed the cake for Christmas! Your narrative says you use semisweet chocolate but the recipe calls for unsweetened chocolate. Which do you use? 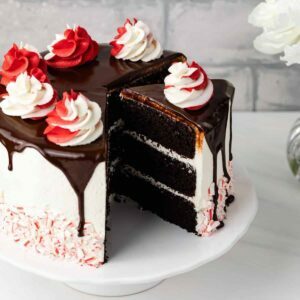 Has anyone actually tried this cake recipe? I made the recipe twice, the same day, and it was a total flop both times! The batter was way too light, and had too much liquid. I followed the recipe exactly as written. Super careful with the measurements, the baking times, etc. The cakes completely fell apart once cooled for 10 minutes in the pan and then turned out in a wire rack— or halfway fell out onto the rack and halfway crumbled out. Just awful. Such a lot of work for a flop. Hi Kati! I’m sorry you didn’t have success with the recipe. I use this same recipe for all my chocolate cakes and it has never crumbled. The batter is thick and silky which bakes up into a fudgy cake. It’s not a light and delicate cake by no means. Instead, it’s more like a soft brownie. Are you using a toothpick to check for doneness? Make certain they are completely done before removing them from the oven. You can also line the bottoms of the pan with parchment paper so the cakes come out smoothly which can reduce the chance of them falling apart while turning them out. Another thing I like to do with cake is turn the layers out onto plastic wrap, wrap them up while they are warm, and pop them in the freezer for 30 minutes to an hour. Cold cake layers are so much easier to work with! And wrapping them up while they are warm will keep the layers moist. Hmm not sure why mine didn’t work— twice!!! Unfortunately, I’ve never tried baking this recipe in mini or regular bundt pans. I had this exact same problem today. I let them cool for about 10-15 minutes and it completely cracked and fell apart. They are extremely fragile. I’m letting them cool for about an hour or more in the pan because they seem less fragile the more cool they are. My cakes were the right consistency and everything, so I’m not sure why it happened! All I know is that it cakes are too warm, they will fall apart when taking them out of their pan! Sorry for your trouble- I feel your pain! What if you didn’t want to use coffee, is there anything you’d substitute it with or can you leave it out? Use 2 cups of buttermilk and omit the coffee. But, I highly recommend using coffee since it enhances the chocolate flavor. If you’re worried about the caffeine, just use decaf. hi jen I just want to wish you a merry Christmas and a happy new year,I enjoy what you do and I thank you for it. Thank you so much, Jean! I hope you had a wonderful holiday. Jen, what type of dark cocoa do you suggest? Would Dutch cocoa be a better choice? The Italian cocoa from William Sonoma is fine to use. Doesn’t this sound terrific and would have been perfect during the holidays! Although I’m sure everyone would love it now even still. Better wait a bit before making it so we can all shed the few pounds we put on during the holidays. Nice recipe. It would definitely still be enjoyed! Thanks for taking the time to stop by, Vicki! Oh, how I love everything about this gorgeous naked cake!! 😉 It looks perfect! Pinned! BEAUTIFUL layered cake Jen! Pinned! I love the raw edge of the cake! (And the crushed candycanes on the side:) I actually don’t mind the melty whipped cream drizzle! (Although, I totally hear you – frustrating when you have SUPER great ideas but they don’t turn out a you imagined). I would totally shove this cake in my face. Naked cakes are so beautiful, aren’t they? It is very frustrating and most of my ideas end up that way, ha. Thanks for reading, Sarah! My mouth is watering just looking at this – peppermint and chocolate together, does it get any better.? It also looks simple to whip up, double bonus. Can’t wait to try. My eyes just popped out of my head! What a GORGEOUS cake! I love naked cakes! 😉 This does scream holiday. It just doesn’t get better than this for a holiday dessert – pinned! You’re so sweet, Jen! Thank you for the nice compliments and pin. I love that this cake is naked and so pretty!! Thanks, Julie! Naked cakes are so elegant. You are way too kind, Sarah. Thank you! This cake looks completely delicious and it’s so festive!!! Thanks a ton for your sweet compliments! THE BEST. I can practically taste it via the mouthwatering photos! Thanks, Maryanne. Buttermilk really does make a difference. Chocolate and peppermint is seriously the best combination ever. Especially at Christmas time! This cake is beautiful Jen, I love all the crushed candy canes decorating it! Thank you, Stacey. You can’t have Christmas without at least one thing flavored with chocolate and peppermint, right? This looks delicious, and it’s so cute! 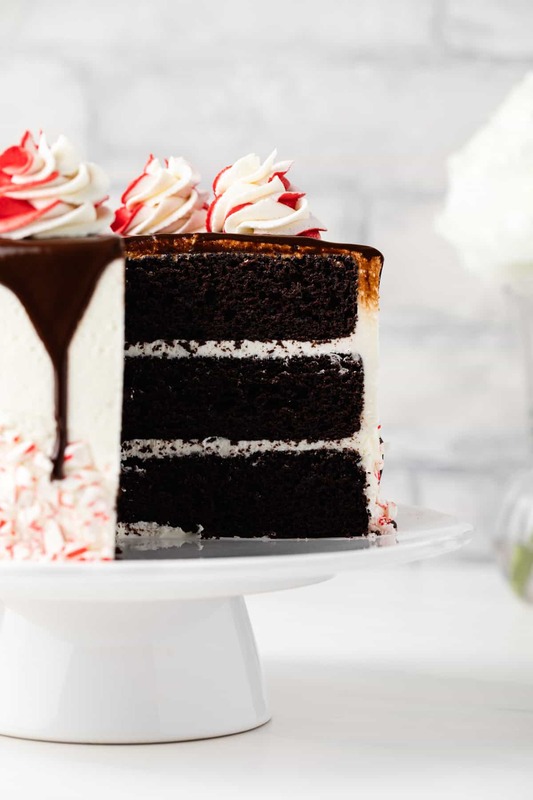 I’m all about chocolate and peppermint right now – this would be so fun for Christmas! Thanks, Rachel! Chocolate and Peppermint is a must at Christmas. That peppermint cream layer made my eyes bulge out of my face! The whole cake looks awesome. Peppermint and chocolate were made for each other. Pinned!! Thanks so much for the pin, Shannon! This cake looks phenomenal! Is it bad that I kind of just want to eat that frosting with a spoon? Oh my goodness Jen, this cake is absolutely stunning!! I love every single layer and element in here! You decorated it beautifully and it totally screams Christmas in the best way! <3 it! You’re too kind, Kelly. Thank you! This cake looks amazing, Jen! I love the creamy filling, combined with a rich chocolate cake. Sounds so perfect for Christmas dessert! Thanks so much for the compliments, Gayle!